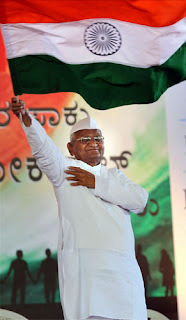 Socialist Anna Hazare waves a Tricolour at a public rally against corruption at Freedom Park in Bangalore on Saturday, December 17, 2011. When the UPA was voted back to power in 2009 with an increased share in the Lok Sabha, one thought that it would be smooth sailing for major policy issues for the next five years and the scope for confrontation would be greatly reduced. However, the converse has been true. 2011 has seen the country on the edge with the government in direct confrontation with many groups and not just the Opposition. Social activist Anna Hazare has probably become the mascot for 2011. He has successfully channelized all the people’s anger against corruption and inflation and turned it into a mass movement. If April was the trailer, then the August Kranti was akin to the angst of the pre-Emergency era. For about a fortnight, Anna virtually held the whole Parliament to ransom as the rest of India cheered him in a spectacle covered 24X7 by the media. The government must have heaved a sigh of relief when Anna broke his indefinite fast. But their problems are far from over and the Lokpal is yet to become a reality.